badgeprint is my open source software which some thousands of participants checked in with at conferences last year. In past 6 years, I organised 10 technology conferences. Participants registered on eventbrite, and checked-in at conferences by our operation teams with iOS/android app. But the bottleneck at check-in is time consuming to search for participant name badges. The worst situation is no mobile and wifi signal at a tech seminar of 200 participants, and we solved it with pens and papers. Years ago, a startup in Hong Kong promoted their event management solution to us by mass emails, but they restricted to use their own registration system. We used eventbrite, therefore no deal happens. For our later conferences, they emailed and service charge is over HKD 10,000. 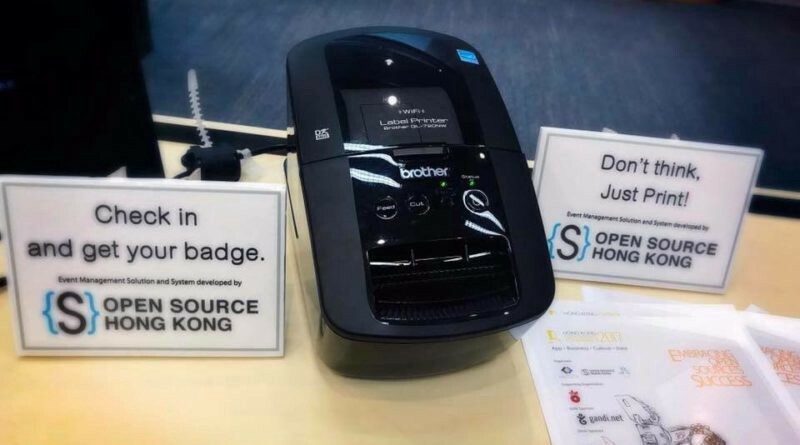 We organises conferences for tech community with free admissions or paid tickets at cost price (or even lost our money), so it is impossible to spend ten thousand HK dollars on “on-site label printing” services. Some months later, our community friend introduced another startup to offer a cost price solution. And their colleagues discuss the solution with effort, we exchanged ideas, and the cooperation also helps them extending their solution. Last year, it was an opportunity for me to develop this system – badgeprint, purchased few label printers, we uses our tech skills to support our community conferences. a solution developed by conference organiser, more understanding about the check-in process at conference on-site. supports Brother QL-720-NW wireless label printer, and two label tapes DK-11202 & DK-11209 commonly in use at our conferences. on DK-11209 label, it prints participant name (English / Traditional Chinese) and company name. on DK-11202 label which is larger than DK-11209, it also prints conference logo or organiser logo, and other details. Check-in counter staffs can give a label to particpants, it is not necessary to stick the label on badge card/paper. supports multiple events, multiple label printers, multiple users. check-in on web interface with a search field of name/phone number/email address. with check-in API, it supports simple & quick “scan & print” with iOS/Android QR code scanner supporting custom URL feature. there is a web administration using Django web admin. an example python script is included which can import participant details from CSV file (eg. exporting from eventbrite.com) and save on Django database. the system is open source! You will not be restricted by any company to use and modify it. This adds valuable flexibility. If your conference or event looking for a solution, badgeprint is one of your choices, you are welcome to discuss solutions for commercial services or non-profit. Lastly, I would like to thank for supports from Henry, HKCOTA, OSHK and Cla, which they helped at badgeprint development, it is possible for us to add more features for conferences. This entry was posted in Open Source and tagged python by Sammy Fung. Bookmark the permalink.